It’s highly recommended that you stay in Punakha for a couple of days if you want to explore it fully. The serene beauty of the Punakha river, the exotic resorts and the unspoiled beauty of the scenery will leave you with memories of a lifetime. Most attractions of Punakha require a little hiking or short drives so it’s recommended that you hire a car for the day which will help you cover all the attractions around. However, you can see the Suspension bridge and Punakha Dzong without a vehicle if you are staying in Punakha. If you wish to cover Punnakha in a day from either Paro or Thimphu (this is closer) then the taxi driver will charge you around 3000 NU for the whole trip. Obviously, you won’t have time to hike to both the nunnery and the Khumsum Yulley Chorten in one day so you must choose your pleasures. If you stay in Punakha, then a day’s sightseeing will cost you around 1000 NU to 1500 NU. Punakha has temperate climate and is warmer than Paro and Thimphu. It is also Bhutan’s largest producer of rice (this accounts for the beautiful scenery) and the former capital of the Dragon land. I visited the Punakha Dzong at around 1.10 p.m. and was forced to wander around for nearly two hours before I could walk inside. Plan your trip in a way that you visit the Dzong in the timings mentioned above as no tourists are permitted inside beyond these hours (though locals can go inside). Many travellers and local Bhutanese people believe the Punakha Dzong is the loveliest Dzong in Bhutan. The beauty is even more highlighted in the season of spring when the towering walls of the dzong are overshadowed with lilac jacaranda blossoms. Historically this dzong is the second oldest in Bhutan and it has witnessed the coronation ceremonies of many kings apart from serving as the Government seat and capital in 1950. This is incidentally the seat of Bhutan’s most influential 600 strong monk community dratshang. It was in 1326 that the first version of Punakha Dzong was built which housed a huge statue of Buddha. 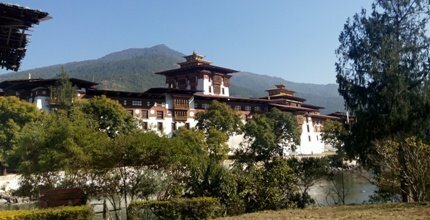 Construction of present Punakha dzong started in 1637 and took a year to be completed where-upon it was named “Punthang Dechen Phodrang” or the Palace of supreme Joy. There is a chapel built inside which celebrates the victory over Tibet by Bhutan in 1639. 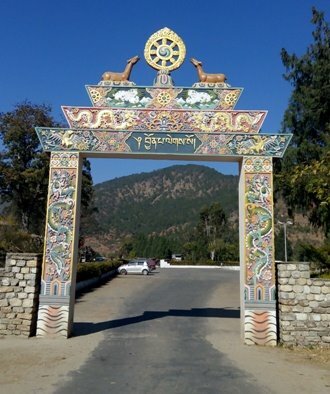 It was the mystical Bhutanese icon Guru Rinpoche who had first predicted that a person with the last name Namgyal will build a huge monastery at the elephant shaped hill. The prophecy came true when scores of years later Zhabdrung chose the hill spot on the confluence of Pho Chhu and Mo Chhu rivers as the Dzong. The dimensions of the Dzong are majestic with 180 m x 72 m and Utse/ middle tower is as high as six storeys. The Utse has a huge gold dome and inside the dzong there are many thangkas, thondrols and religious artefacts which are only displayed in important festive occasions. The Punakha Dzong saw a series of disasters and natural calamities like an earthquake in 1897, glacial lake spill in 1994 etc. I had to cross the Bazam Bridge to walk to the Dzong. The guard standing at the entrance of the dzong was kind enough to explain the many features of the dzong like high wooden stairs and a huge wooden door that was used for protection against invaders. There are several things you must pay attention to once you enter the dzong. Firstly, this is one of the rare dzongs with three different docheys or courtyards. The first courtyard is meant for taking care of administrative work and contains a big chorten and a sacred Bodhi tree. The second holds quarters of the monks and the coronation and ceremonial rooms. The third courtyard has the sacred remains of Pema Lingpa and Zhabdrung Namgyal. Interestingly, the Bhutanese like the Egyptians practised a process of embalmment and preserve their sacred remains in Machey form (Bhutanese version of Mummy). Only the King and the Head Monk can enter these rooms. You can spot a quaint shrine containing tantric elements that is dedicated to Tsochen or queen of the snakes. You will also be able to see a huge assembly hall containing close to 54 pillars. There are beautiful Murals inside showcasing the Life of Buddha and intricately designed gold panels. The inner sanctums of the Dzong have magnificent colour play of red, gold and black wood carvings. The Utse of the Dzong contains Rangjung Kharsapani (Bhutan’s most sacred possession) or a self-made painting of the Chenresig. 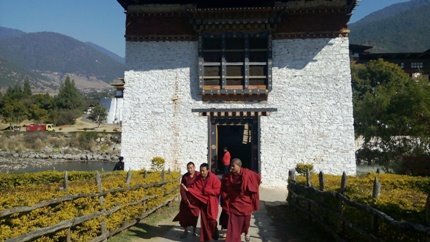 Unfortunately, it’s closed to members of the public except for the famous Punakha Drochoe festival. When you exit the dzong from the northern side, you may visit the dzong Chung and seek blessings from the Shakyamuni Buddha. Also, notice the huge cremation ground on the North side and the Royal Palace on the Eastern side. The Royal Gate is the latest addition to the Punakha Dzong Complex….it was built to celebrate the wedding of Bhutan’s current king. No photography is permitted inside the Dzong and there are guards everywhere. Monks walking around were helpful enough to point out many distinct features of the place. The Punakha Dzong visit will take you at least 2 hours as it is important to sit and soak in the incredible beauty of the place. 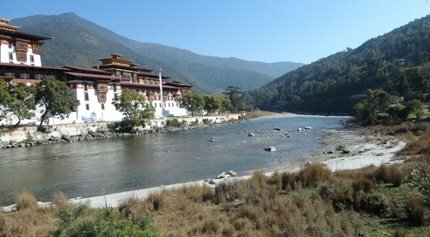 If you are travelling from Thimpu to Punakha then you will find the Metshina Punakha River at one point and here you can visit the revered Chimi Lhakhang that was built in the year 1499. This is also known as the temple of the divine Madman. This ancient temple has strange mystical properties as it was built by the Lama Drukpa Kunley after evil demons were subdued by the mad Lama with his special lightening powers (which supposedly originated from his Phallus). A huge statue of the thunderbolt of the Lama is kept in the Lhakhang and is believed to have strange potent properties. Many childless women flock to the temple every day to receive divine blessings of the saint and increase their chances of conceiving. The temple is founded by the cousin of Kunley and his statue is a part of the temple complex. The slate carvings in the Chimi Lhakhang are extraordinarily beautiful and there is a huge Bodhi tree here that’s brought in from Bodhgaya. The distinctive features of Chimi Lhakhang are the huge statues of Chenserig (with 1001 arms) and Sakyamuni Buddha and Zhabdrung. There are many kinds of Phalluses on display in the temple and some are made with wood while others are made with animal bone. There is a collection of wooden slips on display in the temple from where participants can select their child’s name. A visit to the Chimi Lhakhang temple provides an insight into different aspect of the usually reticent Bhutanese culture... the colourful life of its leading saint Kunley. The chapel inside has many murals depicting Kunley’s romantic escapades besides containing a Chorten. Chimi Lhakhang gained its epic reputation as a wish fulfilling place for childless women because of the phenomenal virility of its patron saints. The women visiting the temple are gently hit on the head with a wooden phallus by the head monk!!! If you visit this temple, you can explore the nearby localities like Sopsokha, Yaoka, Pana and fields of red and white rice. This is a good place for walking and hiking trips. Incidentally, the Mad Lama is the reason as to why Phallus souvenirs are sold in curio shops and many houses, hotels and shops have phalluses painted outside them. 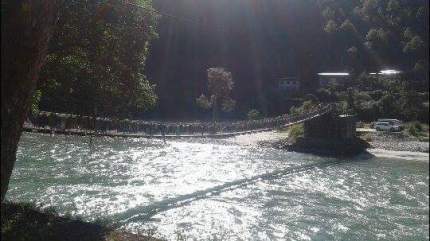 The Punakha Suspension Bridge is known to be the second largest suspension bridge in Bhutan. This spot is perfect for photographers and nature lovers as there are stunning views all around. 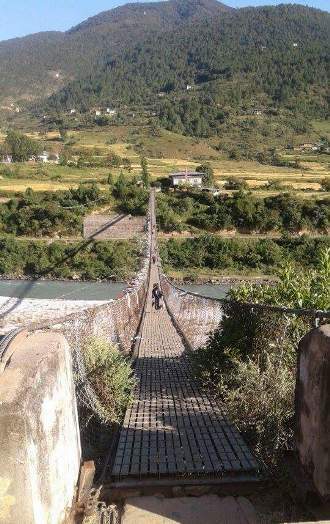 This suspension bridge connects the town of Punakha with the dzong and nearby village settlements. Walking on this bridge is a nice experience. Khamsum Yulley Namgyal Chorten is not very old (it was built in 1990) but it’s amazing beauty and location makes it a worthwhile visit in Punakha district. This Chorten took ten years to be built and was erected by the orders of the Queen Mother for protecting the King and the people of Bhutan. The Chorten is about 30 minutes of drive away from the Northern part of Punakha. However, like the Tiger Taktsang, it requires some serious hiking to reach the top of the ridge. The walking trail is a little risky during summers though the view is good. For ornithologists, the walk from the Khamsum Yulley Namgyal Chorten to the Punakha Dzong via the Sonagasa village is a popular walking trail. The walk to the Chorten is as memorable as the Chorten itself which is a nice example of colorful Bhutanese architecture. Ponies are available till a certain point in the hike after which you still must climb 45 minutes to reach the Chorten. Carry fruits and water with you on this trip as you sure to feel famished. Total up and down journey will take you close to 3 hours (not counting the drive from Punakha). If you are not up to hiking then try reaching the Chorten after walking through the Punakha suspension bridge.. it will just take you half an hour. In case you are driving from Thimphu to Punakha (as I did) then you will be able to visit the Dro Chu La Pass on the way (it’s about half an hour away from Punakha). The Dro Chu La pass is the highest point in the whole region and it’s bitingly cold there at almost all times of the year. This is also one of the most scenically beautiful place you will see in Bhutan. 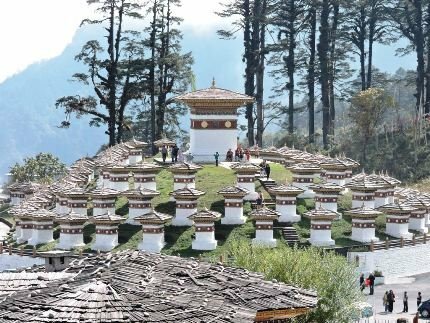 There is a beautifully grouped complex of 108 Chortens in the Dro Chu la pass which are built in memory of the soldiers who sacrificed their lives in the Bhutan-Tibet war. Jigme Singye Wangchuk Himalayan Range visible from here. There is a beautiful restaurant with glass walls that provides a spectacular view of the Himalayan Vista. It’s an amazing place to have a drink, sip on coffee or to have Lunch. 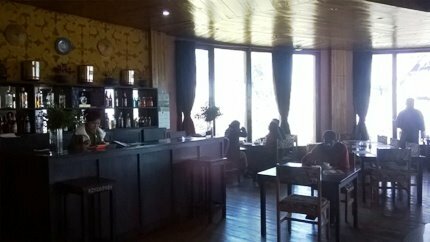 The restaurant is entirely maintained by the Bhutan Government and is one of the most sophisticated establishments in this area. There is also a handicraft store selling many artefacts and souvenirs though it’s not recommended to buy anything from here. Spend about 20 to 30 minutes at this place and soak in the amazing vista that this spot offers. If you are travelling to Punakha then you need to time your visit carefully as Dro Chu La Pass has to be visited before the sun sets. If you are staying in Punakha for more than a day, then you can consider visiting the Sangchen Dorji Nunnery which is situated on a hilltop overlooking the town of Punakha. The Nunnery is beautiful with classic Bhutanese paintings adorning its ceilings and walls. Incidentally this place is a monastery which is entirely managed by nuns (hence the name nunnery). Try reaching this place around sunset so you can watch the beauty of the setting sun. this is Punakha/s newest tourist attraction (built in 2015) by the orders of the Queen mother for celebrating the 60th Birthday of the fourth king of Bhutan. Note: Do not try ringing any of the bells around the Nunnery. They are meant for specific purposes and not as a form of prayer.